Best Practices - Lab Reconfiguration - Hereva Consultants Inc. Check out Hereva’s latest news and events. Given how tight the current real estate market is, it’s no wonder more and more life science labs are deciding to renovate and reconfigure their existing lab spaces rather than seek relocation. Reconfigurations make sense on any number of levels – but they also come at a cost and have their own inherent set of complexities and problems. That’s because one of the biggest issues to reconfiguring an existing lab space is that, in most cases, the labs need to keep working during the renovation. That fact needs to be in the forefront at every decision point. It’s crucial to have buy-in and input from all stakeholders; from the end users to the EHS & facilities teams, from the scientists to lab operations, IT to security. It is important everyone understand that while changing the layout and adding new functionality to their lab may be necessary for realizing their future vision and growth, the build-out, by its very nature, can be highly disruptive and an interruption to the ongoing, everyday work. Beside general space planning you need plans for the mitigation of not only interruptions to the work, but you also need to address the potential for contamination from demolition and/or construction. And because the reconfiguration is to an existing, occupied lab, the input, collaboration and support of the EHS & facilities teams is paramount to success. Reconfigurations often involve changes to infrastructure such as water, electrical, HVAC etc. The involvement of the facilities team is crucial at each stage of the project. Involve your stakeholders and establish a project charter. This document will identify, define and record the project drivers, risks and priorities, articulate your goals, and serve as a reference throughout the upcoming project. Once you have your project charter, the next step is an accurate and detailed inventory of equipment. This equipment list covers both what is already there, and what will be needed in the future. The information in this document will impact everything in the lab and all decisions going forward. Plan and work out needed processes; for instance, when equipment must be taken offline. 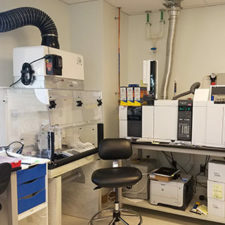 When the lab reconfiguration project occurs within existing lab buildings, there is already infrastructure in place to support their functions. Understanding this infrastructure will help determine the costs, scope and level of difficulty of the reconfiguration – for instance, it’s not easy to go from a biology lab to a chemistry lab, but the inverse is less challenging. As such, building flexibility into the new space can save time and money down the road if you undertake additional reconfigurations. Once your inventory and infrastructure evaluation has been completed, spend time carefully considering the intrinsic value of the existing lab. Before investing capital, re-evaluate the goals and desired outcome. Perhaps you will find the expense and disruption of the reconfiguration does not justify reconfiguration and your client’s goals would be better served in a new location. Use your project charter as a guide to ensure the reconfiguration is going to accomplish what you set out to do. Although starting any lab renovation project can be daunting, spending time carefully considering these factors will set you up for a success. Ciara McGurran is a Project Director with extensive experience in the uniquely technical bio/pharma lab environment. As an integral member of the owner’s facilities and operations teams, Ciara has a thorough appreciation of all areas of the programming, design and construction of highly specialized build-outs from inception through the operational life of the space. To read more about Ciara, click here.